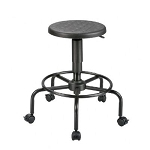 An extremely rugged and stable utility stool on a traditional American-style base. 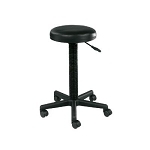 This model has a durable urethane seat and backrest built to withstand heavy use in rigorous work environments. Will resist punctures, water and most chemicals. 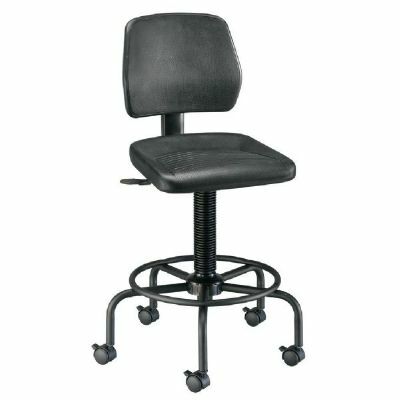 Features include pneumatic height control, a height and depth-adjustable hinged backrest and a 23" diameter black powder-coated tubular steel base with built-in foot ring. Seat is 17"w x 16"d x 2" thick. 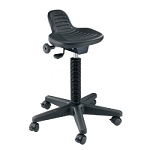 Backrest is 15"w x 12"h. Height adjusts from 21" to 28". Comes complete with a set of locking casters and a set of non-slip floor glides.